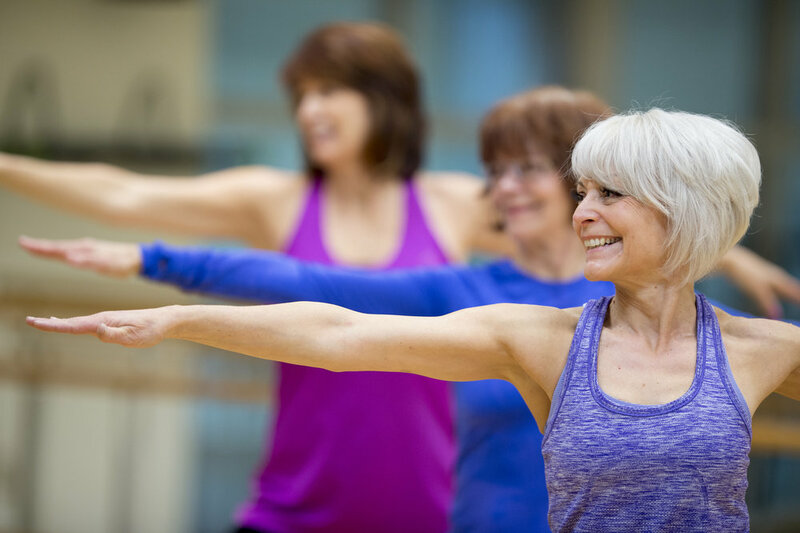 The Club's Group Exercise Program offers a wide variety of classes for our members of all fitness levels. We proudly offer our members all the Les Mills series classes as well as many others. We encourage you to try any or all the classes you would like. Each can be adapted to your personal fitness level. We have great instructors that have years of knowledge and experience to provide a safe and fun atmosphere in each class. A basic BARRE workout using high repetitions of small precise movements to tone muscle, build strength, teach muscle control & imporve overall posture. Safe and effective workout with an assortment of low impact cardio, balance and postural focus. Great for rehabilitation and beginners. A 55-minute, sports-inspired, hi/lo cardio workout for building strength and stamina. A 55-minute, martial arts-based fitness program with moves from Karate, Taekwondo, Kung Fu, Kickboxing, Muay Thai & Tai Chi. A simple, athletic step workout with high intensity intervals followed by muscle conditioning tracks that will shape and tone your entire lower body and push your fat burning systems into high gear. A Bodystep class for those who want a more intense workout with power & strong functional step training. Combines martial arts techniques with fast paced cardio for a fun and challenging workout. 25 minutes of abdominal and lower back strengthening exercises. A fun & active suitable for all levels. A revolutionary core training class taught with power and precision. Get a stronger body in 30 minutes! 45 minute Road Ride plus 15 minutes of Core Training. An adult recreational aquatic exercise program designed to accommodate the abilities of individuals with limitations. The class improves muscular strength, endurance, and flexibility. A 30 minute HIIT workout designed to improve athleticism with explosive moves and agility training. A 30 minute HIIT workout designed to improve strength and build lean using a barbell and weights. Fun & exciting country line dance instruction for cardiovascular fitness. A variety of dance styles in one class. 100 percent pure muscle sculpting from head to toe using a variety of equipment, from steps to weights, along with lunges, squats, dips, and power moves to get those muscles into shape. A 50-minute, indoor cycling class based on the outdoor riding feel. Ride to inspirational music over the equivalent of 20-25 kilometers of varied terrain, controlling the intensity of your workout with a resistance dial and pedal speed. Go the distance! A 60 minute RPM class with 2 additional song tracks! Test your endurance level. A 30 minute mat based pilates class in the standing position. Focus is on posture, balance, and core. A little something special and different every Sunday– RPM, Road Ride or The Journey. Slow graceful movements & synchronized deep breathing.Works on posture, core strength & flexibility. Venture into new territory in the 60 min cycle class designed to help improve performance, endurance and strength. Strength and conditioning intervals both in and out of the water. Wear appropriate pool attire. Goggles are optional. Combo of standing & mat pilates and yoga. Strengthen, lengthen & tone. A combination of gentle Hatha and restorative work. Improves range of motion and joint mobility reducing the effects of stress. "To move fast & have fun!" 55 minutes of easy to follow dance moves: Meringue, Cumbia, Salsa & Reggaeton! Ditch the "workout" and join the party! Open to all levels! Great friendly staff. Great variety of workout equipment in the facility and terrific group exercise instructors. The instructors work with you and push you to your limits. They make sure you are being safe, but working your hardest. I love this club!